Luton Town U18s were knocked out of the FA Youth Cup at the first round stage with a 2-1 home defeat against Stevenage last night. The visitors dominated proceedings early on as Joe Leslie fired just wide after two minutes before they broke the deadlock in the sixth minute, Ben Wilmot heading a corner past Tiernan Parker. Belgrove was at the heart of Luton’s attacks, as he headed goalwards, with Harness saving well, but after the break they fell further behind, Andronicos Georgiou curling it into the bottom left corner from 20 yards. 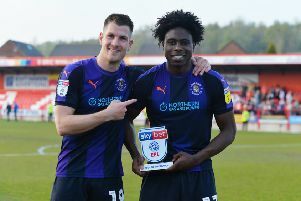 Hatters keeper Parker pulled off a fantastic save in the final minute from Georgiou as Inigo Idiakez’s side grabbed a consolation in injury time, Joe Mead setting up Michael Shamalo to shoot home. Hatters: Parker, James, Mead (C), Panter, Byron, Sorunke (Richardson 60), Peck, Read, Belgrove (Jones 76), Tomlinson (Shamalo 61), Neufville. Subs: Ellis, Shamalo, Beckwith, Richardson, Jones. Boro: Harness, Sackey-Mensah, Wilmot, O’Keefe ©, Omar, Taylor-Cole, Gouldbourne, Lontton, Draper, Georgiou, Leslie. Subs: Fernandez, Payne, Smyth, Field, Moriarty.